Berkeley Breathed’s classic 1980’s comic strip is collected in all its subversive, satirical glory! Opus the Penguin. Bill the Cat. Milo Bloom. Steve Dallas. 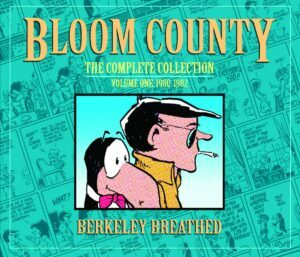 Created by cartoonist Berkeley Breathed, these characters lived in a middle American town, in a place called Bloom County. One of the defining comic strips of the 1980’s, Bloom County chronicled the Reagan years with subversive flair, skewering the politics, culture, and excesses of the era. From figures like Jeanne Kirkpatrick and Donald Trump to Bob Woodward and Lee Iococca, Bloom County deflated the pretensions and pomposity of the time. This groundbreaking comic strip is collected by IDW in Bloom County: The Complete Library. Over the course of five volumes, every Bloom County comic strip from the debut on December 8, 1980 to the final strip on August 6, 1989 will be reprinted, taken either from the original printer proofs or Breathed’s own artwork. The first volume in the series collects the strips from the series’ debut through September 1982, introducing readers to the characters, like Opus and Bill, who established themselves as icons of the era.